Silver Lätt and Kristin Tattar are arguably the best Open and Open Women players from Estonia, and they’re also a couple. 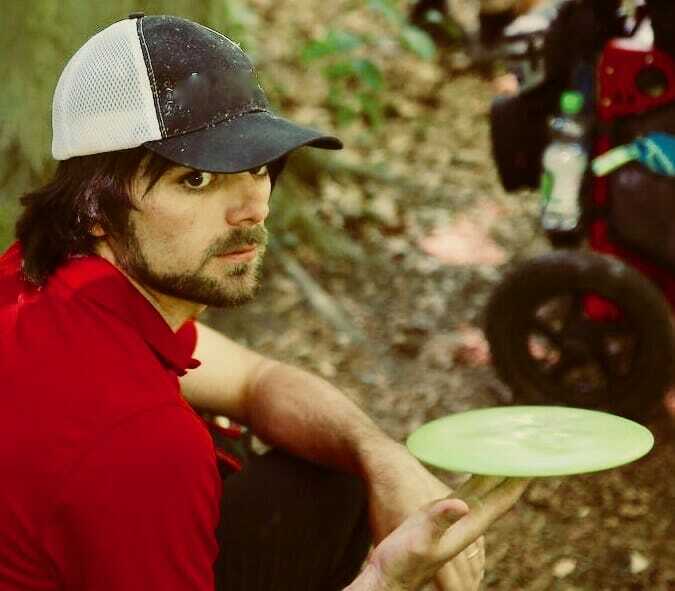 The duo is traveling in the U.S. for five weeks, starting at the Disc Golf World Championship in Vermont, and ending with the United States Disc Golf Championship in South Carolina. Every week or so, I’m checking in with them to find out how they’re feeling about their adventures on and off the course. Note: This interview was conducted before the United States Women’s Disc Golf Championship. Iron Hill Or Backhand Hill? Both Tattar and Lätt played in last week’s Delaware Disc Golf Challenge on the very wooded Iron Hill course. It was the first National Tour event either had played, so I was curious if the tournament stood out to them in any way. The answer? Not particularly. As for the course, both thought it was “good,” and Tattar “really liked it.” But the forehand-dominant Lätt had a bone to pick. That was Tattar’s Circle 1 putting percentage for the final round in Delaware. Not only is the statistic impressive, it was also essential to her success. Had Tattar missed just one putt in the final round, she would have tied world champ Paige Bjerkaas for third instead of besting her by one stroke to take solo second place. Tattar’s initial comments about this impressive finish are a testament to how a relatively conservative game plan that’s well-executed can pay dividends. Going into hole 17, it seemed Tattar had not only opened that door, but had stepped through it and was looking around for a comfortable chair. However, mistakes on the penultimate hole meant comfort was not in her future. Tattar’s upshot only found the “edge of Circle 1” while Bjerkaas parked hers. There’s no bigger test for a 100-percent Circle 1 putting round than staring down a basket nine meters (approx. 28 feet) away to stay ahead of a competitor like Bjerkaas on the podium, but it was one Tattar needed to pass. “I was so happy that despite the pressure I executed my shot and was able to take second place,” Tattar said. For those who watched the Jomez Productions coverage of the Open division in Delaware, you heard Lätt’s name brought up by commentators Jeremy Koling and Paul Ulibarri for his eagles in rounds one and two on the par 5 hole 5. Here’s a little more on those from the man himself. Though Lätt’s first eagle can be chalked up to a lucky — though nevertheless spectacular — throw-in, his second was the result of perfect execution. “Second round I got all the distance I needed off the tee, and after my second shot I had a 20-footer for eagle,” Lätt said. Those eagles were part of Lätt’s generally strong play over the weekend, which earned him a 12th place finish. “One of my goals in every single tournament is to be the highest on the leaderboard of any under-1000-rated player, and this time I succeeded,” said the 996-rated Lätt. In fact, he was the only player under the 1000-rated mark to finish in the top 25. A side story Lätt told me about had to do with some winged creatures a lot less welcome than eagles. On one hole in Delaware, Lätt found himself far off the fairway. After finally locating and setting up behind his lie in the thick rough, he suddenly noticed “about 100 hornets” right underneath him. Lätt ran away immediately and managed to only get stung on his left hand (his nondominant hand). Because the lie was dangerous, Lätt’s group gave him relief. Along with the miraculous save, Lätt said people in the gallery helped him recover the equipment he had left when he ran from the hornets. The next stop for the Estonian couple was the United States Women’s Disc Golf Championship in Lansing, Michigan. When I talked to the pair, Tattar had already gotten in some practice rounds, albeit not without a little trouble. Tattar was still hoping for good results despite these complications, and Lätt will be doing everything he can to make those hopes reality. Ten-plus hour drives to go on vacation or see family are common for many Americans. To most Europeans, however, this type of road trip is simply exhausting. Lätt and Tattar are no different. The two weathered the trip with frequent pit stops — including one at an outlet mall. However, since they eventually need to reach Rock Hill, South Carolina, there’s still a long way to go. All we can do is wish them well and assure them that being cooped up in a car for hours on the interstate is one of the most authentic American experiences there is. Comments on "Kristin Tattar and Silver Lätt Do America: Part 3"